The government has told Europeans they will not be forced to leave the United Kingdom. That’s welcome. But many grey areas will depend on the judgement of overworked bureaucrats. Worse still, any pledges could be rendered invalid if Britain crashes out of the EU without a deal. Hedge fund Third Point’s ideas for the Swiss maker of KitKat are sensible but obvious. Nestle is already weighing up asset sales. It has set and missed targets before. Shaking up the company’s slow-moving culture would achieve more – starting with a new chairman. The city that taught London about lending lags Paris and Frankfurt in pitching its appeal as a financial center. Fashionable lateness is a Lombard charm. So are fine universities, clever financiers, tax incentives, a strong work ethic – and easy access to beaches and mountains. The Gallic president’s talent for upending politics is beyond doubt after his party won a huge parliamentary majority. He now has a free hand to pass labour and tax reforms. His legacy hinges on whether he can lay the foundations for future prosperity without jeopardising growth. Germany has bristled at draft U.S. sanctions against Russia, claiming the global policeman is overplaying its clout. Europe is readying a big fine for tech giant Google for doing something similar. Bullies aren’t easily toppled, but countries are harder to rein in than companies. French President Macron is griping over Italian shipbuilder Fincantieri’s bid to buy a stake in a French firm. The deal could create an EU champion, but compromise French jobs. Macron is a fervent believer in Europe – but domestic concerns don’t sit easily with idealism. France’s pro-European president, Emmanuel Macron, has given new hope to advocates of joint euro zone debt. But expect Teutonic resistance. Europe’s biggest economy is loath to give an implicit bailout guarantee to its own regions so will hardly extend one to other countries. The Conservative party’s loss of a majority weakens its hand in talks with the EU. Bringing Jeremy Corbyn’s Labour into talks could strengthen it, and cut the chance of a chaotic exit. The opposition may prefer to see its rivals implode, but Corbyn would get blamed for the mess. Leo Varadkar will be Ireland’s youngest prime minister, prompting comparisons with France’s Emmanuel Macron. Parallels with Italy’s former PM Matteo Renzi are more apt. His government is weak, and he could be at odds with Europe on Ireland’s chief challenges of Brexit and taxes. The European Commission has suggested creating low-risk securities by pooling sovereign bonds. The idea is to reduce banks’ exposure to governments. But risks would still be interconnected. Without a common tax base and joint liability, no pan-euro zone debt can be truly secure. Spain wants the bloc’s 19 governments to pool their debt. That idea is likely to be shunned by Germany. Yet mutualisation is happening anyway through bailouts and central bank largesse, and countries are less profligate than they were. Common bonds needn’t mean wayward spending. As European airlines engage in a costly battle for market share, the UK no-frills carrier is buying ever-larger aircraft. EasyJet’s cost advantage and the impending demise of weak rivals suggest boss Carolyn McCall is right to look beyond the short-term clouds. The French media group reckons the convergence of advertising, distribution and content justifies its 3.9 bln euro offer for the ad firm. Yet the numbers don’t add up without heroic assumptions, and Havas customers may not take kindly to the new arrangement. France’s new president needs German support for his euro zone reform ideas. Angela Merkel’s challenger Martin Schulz is more supportive of tighter fiscal integration and more investment. The triumph for Merkel’s party in a regional poll suggests any changes will need her consent. The EU may demand 100 bln euros from the UK for leaving the bloc. Some Britons want to pay nothing. Investment bankers ease impasses between companies by making part of the cost contingent on future performance. Linking the bill to UK GDP might enable both sides to claim victory. Marine Le Pen’s anti-euro rhetoric will be a liability in Sunday’s election. Some undecided voters may share the far-right leader’s distrust of the EU. But ditching the single currency would be punitive for a country with the euro zone’s third-highest savings rate. Brussels may try to restrict euro-denominated clearing in the UK, a report says. European regulators have long fretted over the fact that most of it occurs outside the euro area. A compromise is more than possible – but is harder to achieve if Britain leaves the single market. 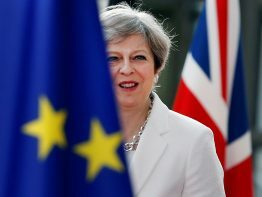 Investors think Britain has a better chance of avoiding a damaging EU exit because Theresa May has called an early vote, a Breakingviews index based on asset prices shows. That view could be challenged by a campaign that will force the prime minister to clarify her policies. It's a year since the two exchanges proposed joining forces. The European Commission will soon decide if the tie-up is anti-competitive. A thumbs-down would spare both sides the need to navigate post-Brexit political waters, and force them to do the sensible thing: wait.